I think it’s fun that unicorns are so popular again. Unicorns were all the rage when I was growing up and my favorites were Lisa Frank designs! I can still picture all the school folders, backpacks, and coloring books with unicorns all over. We even played “unicorns” on the playground. Lol Yeah, we were dorks, but we were also first graders! 😉 There is just something amazing about a magical horse with a beautiful horn. I think most girly girls can agree with that. 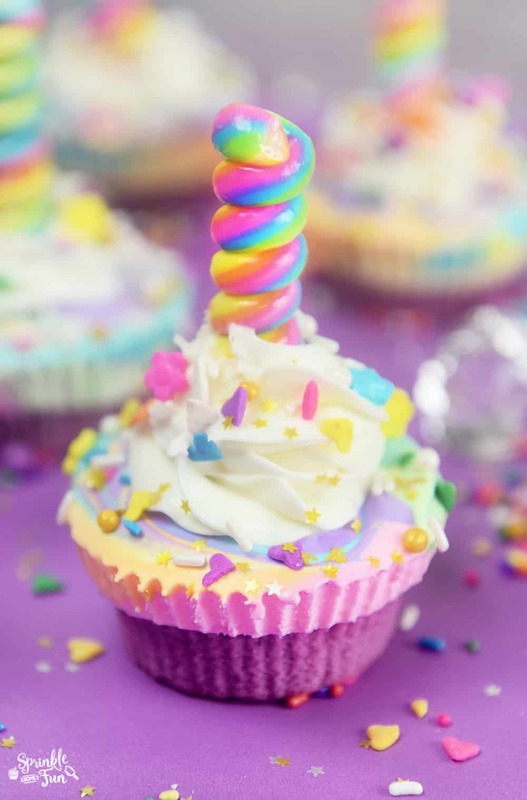 That’s why I knew I had to create an ice cream cupcake fit for a unicorn celebration! 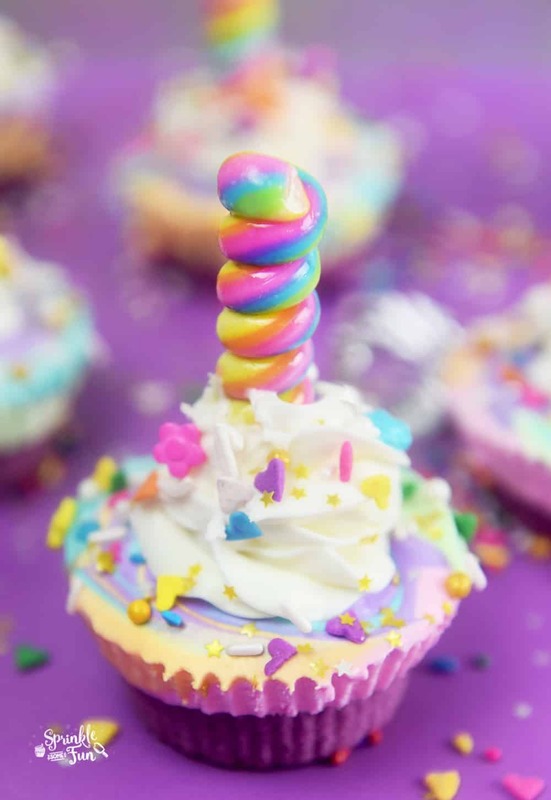 These Unicorn Ice Cream Cupcakes are real and they are as magical as they sound! Ice Cream Cupcakes are one of my favorite things in the world. I have been experimenting with different ways to make them and I think I have come up with the perfect formula. I like using half cake and half no churn homemade ice cream for the best results. Before making them this way, I was using store bought ice cream and the consistency was a little hard to get just right. Just look at all that swirly ice cream goodness!!! 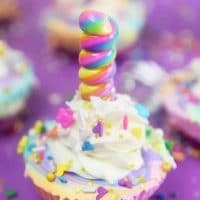 I really love how these Unicorn Ice Cream Cupcakes turned out and how colorful they are. They taste just as great as they look, too. 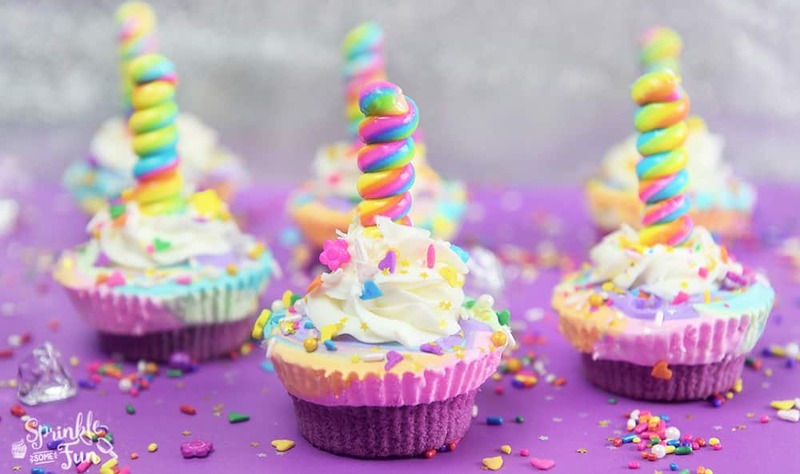 Ice Cream Cupcakes are always perfect for parties because you just serve the cake and ice cream together. These can even be made ahead with the whipped topping for easy serving. This post may have affiliate links. As always, you won’t pay extra by clicking these links, but a small portion goes to maintaining this site. Here are some links to the products I used and other alternatives in case you can’t find these exact ones. Unicorn Twist Lollipops: For the lollipops I used a kind I found at Walmart here. If you can’t find them at Walmart then these Twist Pops (affiliate) from Amazon look pretty too. 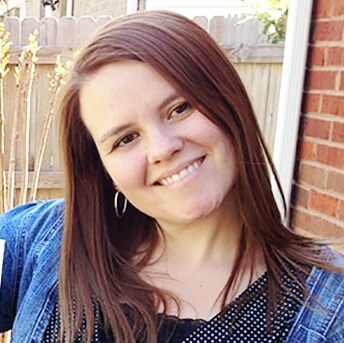 Food Colors: I used the Wilton colors (affiliate) because they are beautiful and bright! You’ll need a yellow and green color too which you can find the Wilton primary colors on Amazon (affiliate) . Sprinkles: You know I love sprinkles. 😉 I used various ones I had already and I will link up below. Cupcake Liners: I used these Geometric Cupcake Liners from Walmart, I haven’t found any others like them yet. I think silver liners (affiliate) or gold liners (affiliate) would be cute too! For the cake: Preheat oven to 350 degrees F. Fill a muffin pan with cupcake liners. Add 1 1/2 Tablespoons of batter (just enough to cover the bottom of the liners) to each liner. Bake for around 15 minutes or until the cupcakes spring back. Let cool completely before topping with ice cream mixture. For the ice cream- In a large mixing bowl whip heavy cream until stiff peaks form. Fold in sweetened condensed milk and 1 tsp. vanilla gently until combined. Separate the ice cream mixture into several bowls (as many colors as you want) and color the mixture in each bowl a different color. Add around 2 Tsp. of each color into the cupcake liners on top of the baked cupcakes. The ice cream mixture should just reach the top of the liners or a little over it. Swirl the colors of the ice cream mixture a few times to give it that swirl effect. Put the ice cream cupcakes in the freezer for 5 hours at least. When they are frozen, you can cover with plastic wrap and leave in the freezer for up to 3 days or serve immediately. For the whipped Cream Frosting: mix the water and gelatin in a large microwave safe bowl. You will want this bowl to be large because the gelatin will foam up in the microwave. Microwave on high for about 20 seconds or until all the gelatin is dissolved. Let the gelatin cool off to a lukewarm temp before adding it to the cream, but don't let it get cold because it will become a gel. Meanwhile with an electric mixer whip the heavy cream, sugar and vanilla on high or until thickened. Add the gelatin to the whipped cream slowly and beat on high until the whipped cream forms stiff peaks. When ready to serve take the cupcakes from the freezer and top with the whipped cream. You can use this whipped cream frosting like you would any other frosting. It will hold the shape for at least 2 hours and holds longer if refrigerated, but obviously, ice cream, needs to be served immediately so you will want to top these right before serving. As with any frosting, it should not sit out too long in the heat. Put some sprinkles on the top, stick in the lollipops and enjoy your cake and ice cream all in one! Last but not least. 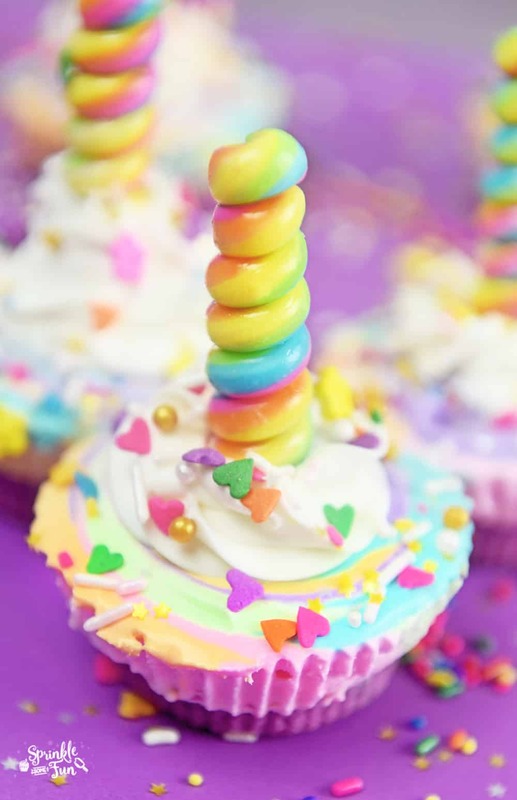 Here is the video tutorial for Unicorn Ice Cream Cupcakes! Enjoy!